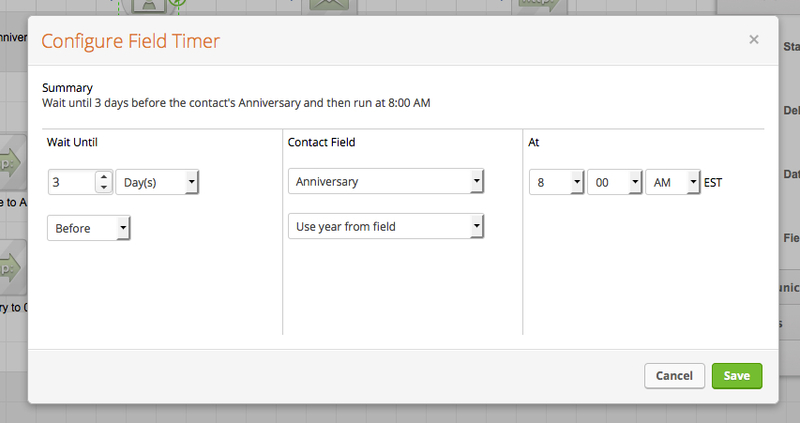 You want to use a date or dateTime field in an Opportunity/Order/Task/Appointment to run a field timer in Infusionsoft Campaign Builder. These fields are not available as merge fields in Campaign Builder. This tutorial and accompanying video gives you the step-by-step to use the Pocket Developer Any Date, Any Format, Anywhere Building Block to programmatically copy the date from the Opportunity/Order/Task/Appointment to a field in the Contact record so it can be used in the Field Timer. You can put the date in an unused Date field, such as Anniversary, or a custom field made specifically for the purpose of “stashing dates” copied from Opportunities, Orders, Tasks and Appointments. * Remember you cannot put a Delay Timer in line with a Field Timer. If you plan to send a series of emails, after the Field Timer, put the emails in their own sequence with HTTP POST in Step 5 at the end. * Once you put a date in a date field, you cannot make it blank again. We set ours to 09/09/2099 when finished just so nothing runs accidentally and we know that field is available for stashing. These record types have not been available in Infusionsoft’s Campaign Builder because they are a one-to-many relationship to the Contact Record. This means each contact can and probably does have multiple opportunities, invoices, orders, etc. So the challenge is how to specify which one you want. The syntax for our notation is Table.Field.[FilterBy(…)][.OrderBy(…)][.Qualifier1[.QualifierN[…]]]. Parameters in brackets are optional. Q. Why isn’t the field I want to use showing up in the Field Timer dropdown?